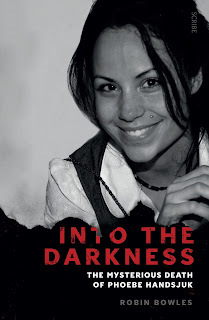 Into the Darkness by Robin Bowles is a true crime book looking at The Mysterious Death of Phoebe Handsjuk. In December 2010 Phoebe bled to death in the garbage room of the Balencea apartment building on St Kilda Road in Melbourne, after falling 12 floors down the rubbish chute. The autopsy and police investigation concluded Phoebe committed suicide however her family refused to believe the findings. Melbourne based author Robin Bowles attended the Inquest into Phoebe's death and brings the case to light in this book Into the Darkness. Having lived in an apartment building for 10+ years, the case details surrounding the building security at Balencea, access fobs, CCTV, rubbish disposal, visitor access, concierge and Owners Corporation were fascinating to me. I currently live on the 18th floor of an apartment building and have a similar rubbish chute to the one at Balencea. I just can't believe anyone would willingly climb into a rubbish chute. In fact, just the thought of climbing into its claustrophobic, dirty darkness is hard to fathom. The only conclusion I can reach is that someone else put her into the chute to dispose of her. There is much speculation about Phoebe's boyfriend Ant Hampel and his behaviour after Phoebe's death was nothing short of bizarre. The only reason I cannot give Into the Darkness five stars in this review (other than the insensitivity of rating true crime in the first place) is that the author Robin Bowles inserts wayyyyyy too much of herself into the text. The first hint of this appears before the Prologue when she lists her dog Miss Deva in the index as her Sleuthing Companion. The list includes all the people named in the book (Handsjuk and Hampel family members, friends, Police, Detectives, health professionals etc) so that the reader can use it as a reference. (And I did, many times). But listing her dog makes an absolute mockery of the list. On page 88 she tells us her husband thinks she's a bleeding heart. (Who cares?) On page 109 Bowles leaves the Inquest early because "there wasn't much more of interest to me." On page 150, Bowles looks forward to a break because her hand hurts from writing and then has dumplings for lunch. On page 175 Bowles is grateful when the day concluded because she has writer's cramp. Bowles even attempts to investigate the case herself by testing the security at Balencea and questioning the owner of the phone repair shop. Bowles isn't a detective and this was highly irregular, bordering on inappropriate. I wish an editor had removed every instance when Bowles referred to her boredom, discomfort, writer's cramp or tiredness. I have no doubt that attending the Inquest every day was emotionally and physically draining for her, and as a reader we automatically respect her dedication. However, when her comments are read alongside the details of Phoebe's death and her family's obvious grief, it comes across as terribly insensitive. Bowles had me gripped with her account of Phoebe's case and investigation into her death and I wish she'd stuck to bringing Phoebe's case to light and highlighting the injustice/s of the legal system. Every time she referred to herself I was rudely jerked from the case and began to resent it. Ultimately, I'm grateful to have read Into the Darkness - The Mysterious Death of Phoebe Handsjuk and to have learned more about Phoebe's life and her tragic death. I don't think we can ever be certain as to who was responsible for Phoebe's untimely death, however I'll never believe she willingly climbed into that rubbish chute. Not without leaving a single fingerprint. Never. Wow, great review. Thank you for the forewarning of the authorship misgivings but your review has left me wondering do I read this? I live in Melbourne and apartments are springing up all over currently. A very relevant book I think our youth today would do well reading regardless. It is definitely going on my goodreads wishlist to read. Thanks Kirsten, I think you should still read this for so many reasons. It's a very interesting case, and I'm glad I know more about the circumstances and Phoebe's experiences having read it. But now you have the 'forewarning' you can let those little comments wash over you and I wouldn't be surprised if you enjoyed it more than I did for that very reason.